Find the Ash Vampires to collect powerful artifacts and make your assault on Dagoth Ur himself. Enter the Ghostgate (east of Caldera and Ald'ruhn), get a map and explore the area. (Optional) Assault the seven Citadels of the Sixth House and kill the seven Ash Vampires, taking the magic items that each carries. 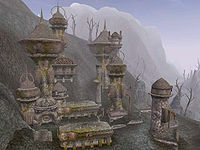 Enter the Citadel of Vemynal, defeat Dagoth Vemyn to retrieve Sunder. Enter the Citadel of Odrosal, defeat Dagoth Odros to retrieve Keening. Enter Dagoth Ur in the crater of Red Mountain and confront Dagoth Ur in the Facility Cavern. Attack the Heart of Lorkhan with Wraithguard, Sunder, and Keening to destroy Dagoth Ur. Return to the Dagoth Ur Facility Caverns to meet Azura, view a cut scene, and receive a reward. 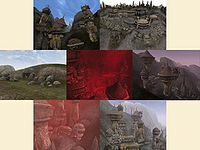 Vivec outlined a five-step plan to eliminate Dagoth Ur: Raids inside the Ghostfence, Raids upon Ash Vampire Citadels, Assault on Gate Citadel Vemynal, Assault on Gate Citadel Odrosal, and Assault on Citadel Dagoth. Enter either tower at the Ghostgate and ask a Buoyant Armiger for a Map of Red Mountain. Scout the Red Mountain region inside the Ghostfence to become familiar with the area's locations and monsters. This phase is optional. However, the following artifacts can be obtained by defeating the seven Ash Vampires: Belt of Heartfire, Amulet of Heartthrum, Amulet of Heartrime, Amulet of Heartheal, Amulet of Heartfire, Soul Ring, and Blood Ring. The artifacts are not required to beat Dagoth Ur, but can be of great use against his magic attacks. The weakest Ash Vampire, Dagoth Uthol, is in Kogoruhn. Other than the main entrance to the ruins, there is also a doorway inside the northwest area of the Ghostfence. Dagoth Uthol can be found in the Charma's Breath area, and holds the Belt of Heartfire. If Dagoth Uthol was previously defeated during The Path of the Incarnate quest, then the journal stage will not be recorded. See the Dagoth Vemyn and the Sunder Artifact section. Dagoth Endus is in Endusal, located to the northwest of the Ghostgate. He holds the Amulet of Heartrime. See the Dagoth Odros and the Keening Artifact section. Dagoth Tureynul is in Tureynulal, located to the northeast of Dagoth Ur. He can be found in Kagrenac's Library, and holds the Amulet of Heartthrum. If Dagoth Tureynul was previously defeated during the Tribunal Temple quest Cleaver of St. Felms, then the journal stage will not be recorded. See the Dagoth Gilvoth section. Dagoth Araynys is in Mamaea, located to the southeast of Gnisis. He can be found in the Sanctum of Black Hope, and holds the Soul Ring. There is also some unique loot in the Shrine of Pitted Dreams bell chamber, including the Daedric Face of Inspiration and the Fang of Haynekhtnamet. Vemynal is located to the northwest of Dagoth Ur. Vivec marks the location of this citadel on the map after talking to him about the plan to defeat Dagoth Ur. Dagoth Vemyn can be found in the Hall of Torque (lower level), and holds the Amulet of Heartheal and Sunder artifacts. 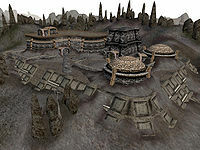 Odrosal is located to the southeast of Dagoth Ur. Vivec marks the location of this citadel on the map after talking to him about the plan to defeat Dagoth Ur. Dagoth Odros can be found in the Dwemer Training Academy (Level 2), and holds the Amulet of Heartfire and Dagoth Odros's Key. The Keening artifact can be found in the Tower area of Odrosal. The door to the Tower can be unlocked with Dagoth Odros's Key. 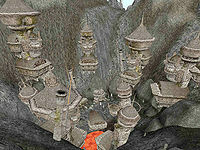 The Dagoth Ur Facility is located in the center of Red Mountain. Before assaulting the facility, three Dwemer artifacts are required: Wraithguard (gauntlet received from Vivec), Sunder (warhammer obtained in Citadel Vemynal), and Keening (short blade obtained in Citadel Odrosal). The easiest path to the citadel is to the southeast, and runs between Odrosal and the Yanemus Mine. The Outer Facilities entrance is blocked by a spherical door that can be opened with a hand crank found on a pipe to the south of the entrance). 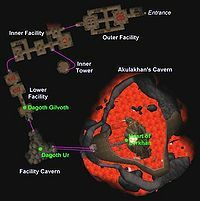 Dagoth Gilvoth can be found in the Lower Facility of Dagoth Ur, and holds the Blood Ring. Dagoth Ur can be found in the Facility Cavern. He will not be hostile at first, and says it is up to you to make the first blow (although he may still attack first after a short period of time). Talk with him for a bit to gain some information, then attack when ready. There's no secret tactic to killing him the first time; just hit/cast hard and he should fall shortly. He will eventually disappear, leaving the Heart Ring near the entrance to Akulakhan's Chamber. Heal up and equip Wraithguard, then Sunder. Dagoth Ur and his minions will attack immediately after entering Akulakhan's Chamber. The goal here is to destroy the Heart of Lorkhan in the center of the great Dwemer robot, Akulakhan. It is possible to get Dagoth Ur out of the way by luring him off the cliff into the lava with Levitate. It's best to use Levitate or Slowfall to reach the giant robot. Be aware that Dagoth Ur will teleport onto the bridge the first time you approach the heart. Strike the Heart of Lorkhan once with Sunder, then five times with Keening to destroy Akulakhan and Dagoth Ur. Run back across the bridge and watch the destruction of Akulakhan, thus ending Dagoth Ur's reign of terror. Follow the ledge back around to the top (or fly up) and open the door to the Facility Caverns using the crank on the pipes in front of it. Once you enter you will meet Azura and a cutscene will begin, outlining your accomplishments. She will leave the Ring of Azura on the ground, which will disappear after leaving the area). When the ring is picked up, a spell called Hand of Azura will be cast on you. This spell is a 100 pts Restore Attributes spell (restores all attributes except Personality and Intelligence). There will be no more blight or ash storms, though some creatures may still be affected. Any remaining Ash Vampires will perish in their lairs, leaving behind their unique artifacts. Sleepers in towns will also wake from their nightmare. Congratulations! You have finished Morrowind's Main Quest! The quest A Lucky Coin becomes available after completing Hortator and Nerevarine. The quest giver, Wulf, can be found in Ghostgate's Tower of Dusk. It is possible to complete this quest before any other part of the main quest, as Sunder and Keening are always available. However, it is very difficult, as you will take massive amounts of damage while wielding the two artifacts without Wraithguard. Once this quest is completed, selecting the conversation topic 'Nerevarine' with NPCs will increase their disposition by 10. This can be repeated as long as their disposition is less than 60. Killing the Ash Vampires does not weaken Dagoth Ur like it is supposed to, as scripts cannot modify stats on NPCs or creatures that have not been loaded in-game. You could visit the first form of Dagoth Ur before killing the Ash Vampires, so the script would work properly on him. The second incarnation is never affected, but after the Heart of Lorkhan is destroyed his health drops to 200 and his magicka to 0. Several journal entries from C0_Act_C do not show up in your journal, because the ashvampire script does not set them. This does not cause any problems, as this specific journal index is not used anywhere else in the game. When you kill the first incarnation of Dagoth Ur, his dead body stays accessible for a short while. If you quickly access his corpse and dispose of it, the door to the cavern will not open, since the script is attached to him (he doesn't carry anything, so don't bother). Both the second Dagoth Ur incarnation and the Heart of Lorkhan are not really immortal. Scripts reset their health every frame. If you manage to inflict enough damage with one blow (super human powers or weapons), they will die. In case of the heart this would break the script. The main quest would never be completed. The heart animations are run without proper parameters, so any hit animation will be delayed until the previous animation has run to its end. You can still hit the heart as fast as you wish and destroy it. You don't need to wait for the animations to display the damage. When you get your journal update after the destruction of the Heart of Lorkhan, teleport is enabled again. That is too early and you must not make use of that. Leave the chamber through the door you came in and meet Azura in the next room to complete the quest and receive her ring. Pick up the ring before you leave, or it will be gone. UMP has moved the command to enable teleporting from the endgame script into Azura's script, so you can not teleport before you've spoken to her. But there is an invisible teleport_enabler object in that room, which enables teleporting as soon as you enter, which is still too early. Just stay until Azura has given you her ring and everything is ok. ? After the destruction of the Heart of Lorkhan all Ash Vampires die. This is done in two places: the endgame script and the ashvampire script. Scripts can modify stats on NPCs or creatures that have been loaded before, so you need to be careful. If you have been to an Ash Vampire's cell without killing him, he will die from the endgame script and his body (and any valuables) may vanish before you get back to him. Ash Vampires you have not visited before will simply drop dead as soon as you enter their cell. Make sure to get their stuff since the bodies will vanish eventually. Even after completing the Main Quest, some people may send you to speak to Archcanon Tholer Saryoni in Vivec to fulfill your destiny. The message occurs once you have visited the Cavern of the Incarnate, reached level 20+, and gained 50+ reputation, and is used only once per actor. 1 Buoyant Armigers at Ghostgate told me that all their intelligence is old. No one has ventured far inside the fence for years. They gave me a map showing the locations of the citadels of the various ash vampires. Sixth House creatures have become more numerous and powerful, and the most powerful can conjure powerful daedra. There are no safe refuges or services inside the fence; I must return to Ghostgate to rest and heal. 1 In the ruins of Kogoruhn, I have slain Dagoth Uthol the Ash Vampire, chief lieutenant of the Sixth House and kin to Dagoth Ur. 2 In Citadel Vemynal, I have slain Dagoth Vemyn the Ash Vampire, chief lieutenant of the Sixth House and kin to Dagoth Ur. 3 In Citadel Endusal, I have slain Dagoth Endus the Ash Vampire, chief lieutenant of the Sixth House and kin to Dagoth Ur. 4 In Citadel Odrosal, I have slain Dagoth Odros the Ash Vampire, chief lieutenant of the Sixth House and kin to Dagoth Ur. 5 In Citadel Tureynulal, I have slain Dagoth Tureynul the Ash Vampire, chief lieutenant of the Sixth House and kin to Dagoth Ur. 6 In Citadel Dagoth, I have slain Dagoth Gilvoth the Ash Vampire, chief lieutenant of the Sixth House and kin to Dagoth Ur. 7 In Citadel Dagoth, I have slain Dagoth Araynys the Ash Vampire, chief lieutenant of the Sixth House and kin to Dagoth Ur. 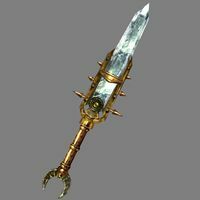 10 In Citadel Odrosal I discovered the artifact blade Keening, one of the enchanted tools created by the Dwemer Craftlord Kagrenac. 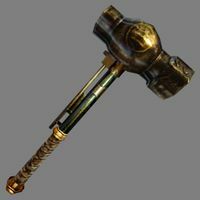 15 In Citadel Vemynal I discovered the artifact hammer Sunder, one of the enchanted tools created by the Dwemer Craftlord Kagrenac. 20 In Citadel Vemynal I discovered an enchanted hammer called Sunder. It appears to be one of the enchanted tools created by the Dwemer Craftlord Kagrenac. But I can handle it without injury when I don't have Wraithguard equipped, and that seems very wrong. 1 Dagoth Endus gave me a bottle of ancient Dagoth brandy. 5 I found Dagoth Ur, and spoke with him. He asked me questions, and let me answer questions in return. And when all the questions had been asked and answered, there was nothing left to say. The time for words is past. Now only deeds can resolve this matter between Dagoth Ur and I. 10 I found Dagoth Ur, and fought with him, and defeated him, but I did not destroy him. He seems to have escaped in a spirit form, perhaps to return and restore from the Heart's power. I must pursue him, and find and destroy the enchantments on the Heart of Lorkhan. 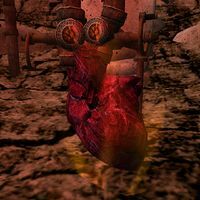 20 I found the Heart of Lorkhan within the giant artifact Akulakhan. I struck the Heart with Sunder, then struck it again and again with Keening until the enchantment was destroyed. Severed from the sustaining power of the Heart, Dagoth Ur was destroyed. But the disturbance triggered an earthquake, and I had to flee for my life. 50 Finishes quest As I fled from the destruction of the Chamber of Akulakhan, I encountered the presence of the Daedra Lord Azura. She told me I had achieved my destiny and was free. The prophecies are fulfilled, and the Blight gone. But now I am Hortator and Nerevarine, Protector of Morrowind, and must defend the people from monsters and villains. She gave me a ring as a token of thanks and blessing. C0_Act_C stage 20 seems to be referring to the Fake Sunder object from the construction set. Dagoth Ur also has a voiceover regarding the fake copy of sunder as well that is never used.